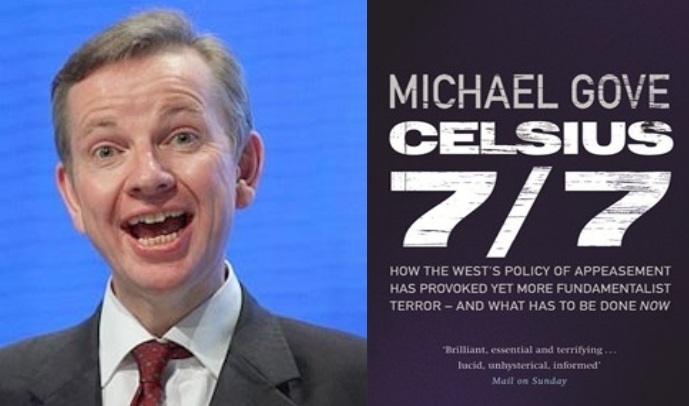 In this series, we will delve deeper into the views held by our new Justice Secretary, Michael Gove as articulated in his book, Celsius 7/7, with additional commentary explaining the neoconservativism underpinning the statements where appropriate, and the impact it has thus far had on the good Britons of this country. Why Such an Offensive Foreign Policy? Gove leads us to believe that democracy is the best “solvent yet devised for Islamism”, or rather, Islamic self-determination. Hence the benevolent West should bestow this loving gift through bombs and arms primarily in the resource rich Middle East. This fantasy justification has been rebutted by history itself, be it through the hypocritical stance taken on the death sentence of the first democratically elected President of Egypt, or the outgrowth of the ever belligerent ISIS from the ruins of neocon foreign policy. The argument that democracy means a safer world is untrue; the US “democracy” has been overthrowing other democracies for decades. No, the real reason is alluded to through shrewd wording. Gove writes that the importance of the spread of democracy is firstly “a matter of simple, prudent statecraft.” While Gove goes on to extol the hypothetical virtues of a “proper” democratic Iran, a trackback is needed and these words carefully analysed. “Prudence” and “statecraft” have very particular meanings amongst neoconservatives. And as the citation of Allan Bloom and reference to Kristol and Kagan’s “moral clarity” in the book shows, Gove is not unfamiliar with American neoconservative works. In other words, a political elite terraforms society by removing civil liberties, and instilling qualities of fascist authoritarianism behind the fear of an external threat. In order to understand how this change is achieved, we need to understand the manufacturing of the threat. In part two of this series, we saw how Gove constructed the “Trojan Horse” – the outsider threat within – by effectively relegating most Muslims and their faith to “Islamism”. Gove informs us repeatedly that we in the West are vulnerable and that in essence, every time we respect the sensitivities of Muslims, fail to strongly assert “liberal values” or bomb Muslims harshly enough, then this is seen as weakness by the “Islamists”, which therefore emboldens them to commit terrorist attacks. Every action of the West is thus reduced a PR victory for Islamists, unless Western responses are harshened. This dual theme runs throughout the book: the weak “us” and the ever-present enemy that is “them”. He then goes onto speak about the Gulf war, critiquing it for the lack of the “proper application of force majeure”, or superior force. Later on he also outlines a passionate, amoral defence of the Iraq war, which I have previously elaborated upon and which completely tears any notion of international legal norms. What is the essence of the above? For Gove, peace is not the best state to be in and warmongering is good because it reforms the social psychology away from individualism towards grandness and collectivism. In the words of the extreme neocon, Michael Ledeen, “peace increases our peril”. What Gove is espousing is textbook neonconservatism of the most vitriolic order. Following their ideological roots of Machiavelli and the Nazi thinker Carl Schmitt, Leo Strauss and his inheritors believe that fear of a threat is a vitally important mechanism for achieving political order and shaping society. As I elucidated above, for neocons, “statecraft” is the art of using wars for the attainment of national goals. What is this “remoralisation”? What type of society are neocons “crafting”? “…the need for exceptional legislation and the temporary curtailment of liberties”. He then cites the Law Lord, Leonard Hoffman’s statement that the terror laws are a “threat to the life of the nation” as an example of the problematic legal establishment. “‘Security leads to freedom’ paradigm is a fundamental principle of child psychology’”. The people are babies. The neocon elite are the parents governing how to exercise freedoms. Michael Gove, his circle of influence and the ideology that he and other neocons in government are implementing are destructive to Britain. Over the course of the past articles we examined his hateful influencers, the positing of Islam and Muslims as the enemy, his horrific views on war and foreign policy, and the draconian suggestions for a securitised nation, whilst underlining the interconnectedness of these policy views. The crucial aspect is that the attack on Islam and Muslims is not only an aim. They also constitute a means. For neocons like Gove, Islam and Muslims are the necessary enemy to effectuate geopolitical change through war and destabilisation, which benefits Zionist interests, and helps the neocons domestically to terraform a “closed society” in which they wield Machiavellian power. Given what has been outlined from Gove’s own writing, we have reason to concur. The “closed society” is cultivated through nationalism and civic religion. I will discuss in a separate blog discussing David Cameron’s “One-Nation Conservatism”. This entry was tagged Carnes Lord, closed society, collectivism, Democracy, Freedom and Security, Human Rights, individualism, Iraq war, Irving Kristol, Islamism, Leo Strauss, Leo Strauss and fascism, liberal values, liberalism, Michael Gove, Michael Ledeen, neoconservatism, neoconservatives, prudence, Robert Kagan, statecraft, Terraforming Britain, William Kristol. Bookmark the permalink.